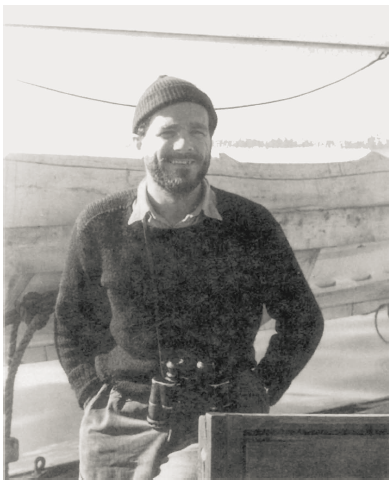 Dr. Maxwell John Dunbar, mentioned later in the text as the author of Environment and Common Sense which was published in 1971, began his “lifelong involvement with the Arctic” in August 1935 during an expedition to map the western Greenland coast (Grainger 1995, 306). Dunbar was born in Edinburgh, Scotland, attended the Merchiston Preparatory School followed by the Dalhousie Castle School, and finally, Fettes College. In 1933, Dunbar began attending the Trinity College in Oxford, England to study zoology where he met ecologist Charles Elton. After meeting Elton, Dunbar was introduced to the Oxford University Exploration Club. Through this club, Dunbar was invited to join the expedition in Greenland. He received a B.A. in 1937 and subsequently attended Yale University in New Haven, Connecticut on a Henry Fellowship (for more information on the Henry Fellowship see Yale University’s webpage https://yale.communityforce.com/Funds/FundDetails.aspx?4438534B376C50326C63483341496C39582F4435696B6F6554694364593150486764566B344156473663736768494B34585863553574432B646D5868384E6275). While studying at Yale University, Dunbar was able to take a trip to explore the glaciers of Alaska. He returned to Oxford, England, when Elton offered him the opportunity to join the 1939 eastern Canadian Arctic patrol. After accepting Elton’s offer, Dunbar enrolled at McGill University in Montreal, Canada as a graduate student. During his time at McGill University, Dunbar experienced the Canadian arctic for the first time by joining the R.M.S Nascopie. Dunbar began serving as the consular representative of the Canadian consulate in Greenland in 1942, and again in 1946. After leaving Greenland, Dunbar was employed by McGill University in the Department of Zoology. After beginning research for the Fisheries Research Board of Canada, he designed the first Canadian arctic research vessel Calanus. In 1947, Dunbar founded the Eastern Arctic Investigations laboratory at McGill University. His active involvement with McGill University continued until he retired and was appointed Professor Emeritus in 1982. He continued his quest for knowledge after “retiring” and published at least 32 articles after 1982 (Grainger 1995, 306-307). Grainger, E. H. "Maxwell John Dunbar (1914-1995)." Arctic 48, no. 3 (1995): 306-07. http://www.jstor.org/stable/40511670.